Mexico’s pioneering “telesecundaria” or “television secondary school” system began back in 1968. It now provides junior high school classes in remote areas, serving about one million students in grades 7 to 9, 17% of the total nationwide enrollment in these grades. Many of the telesecundaria lessons are now available on the Internet, and before long, about 4,500 classes will also be available on a DVD collection. The geographical network of telesecundarias is truly amazing. In the early 1980s, I came across one high in the mountains in a distant corner of the state of Hidalgo, in a remote Huastec village, beyond even Coca Cola’s delivery routes. A visitor was such a surprise that the entire village turned out to inspect me! It was that experience that made me realize that Mexicans take education very very seriously. 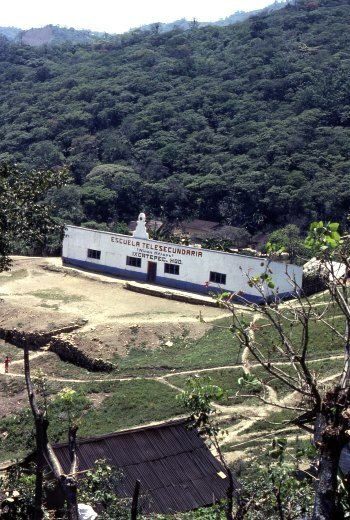 The telesecundaria was perched on the hillside overlooking the village. I later discovered this was a fairly typical example, with three classrooms, rustic restrooms in an outhouse, and a small playground. Most telesecundarias also have a science laboratory and a small library. The students in a telesecundaria do have a teacher, but this teacher teaches every subject, whereas in a regular junior high, each student will have up to twelve different subject specialists. Every telesecundaria classroom has a television set to receive lessons broadcast by the Education Ministry (SEP) in Mexico City. In the early days, lessons were very traditional, and the TV programs were little more than continuous shots of a “talking teacher”. Interestingly, almost all those early lessons were broadcast live. Nowadays, the entire process is much slicker and far more professional. The TV programs are 15 minutes long and feature all kinds of material, including animated graphics and video footage. Watching them, you are unlikely to see the “talking teacher” even for an instant! It takes about 20 days to produce each 15-minute module and costs up to 50,000 dollars. Most programs have a useful life of between five and ten years, depending on the timing of significant changes in subject content and teaching methods. After students have seen the TV broadcast, the classroom teacher then uses the remaining 45 minutes of each hour to explain the lesson in more detail and to monitor students as they complete related tasks from their special telesecundaria textbooks. Nationwide satellite transmission of programs began in 1994 (EDUSAT), enabling the coverage to spread far beyond those areas previously served by conventional TV stations. Programs are broadcast daily. Telesecundarias have proved to be an extraordinarily effective way of improving access to, and standards of, junior high education across Mexico. While the “costs of delivery” are estimated to be 16% higher in telesecundarias, on a per student basis, than in regular junior high schools, they are significantly cheaper on a per school basis. This means that some of the nation’s 13,000 or so telesecundarias can function cost-effectively even with only 10 or 12 students in each grade level. Are telesecundarias successful? It certainly seems so. An estimated 79.4% of telesecundaria students complete grade 9, compared with an equivalent figure of 78.8% for regular junior highs. In addition, one study has shown that telesecundaria students may start Grade 7 significantly behind other students but generally catch up completely in math and reduce the deficit in language. The program has been adopted by most Central American countries—Costa Rica, El Salvador, Guatemala, Honduras and Panama—and pilot projects are underway in the USA in California, Colorado, Pennsylvania, Oregon and Florida. So next time you’re traveling in the wilds of Mexico or Central America, play “I spy” and see how many telesecundarias you can find. Bonus marks should be awarded for any that are outside the normal delivery range of Coca-Cola or Sabritas! I am eager to learn about the pilots in the United States. Please send me information so that I might be able to make contact with those in California and Oregon. Thanks for your interest in geo-mexico.com. We don’t have specific contacts, but suggest you contact the respective departments of education. References to the telesecundaria in Oregon include: http://www.ode.state.or.us/search/page/?=2409 and http://www.hsd.k12.or.us/LinkClick.aspx?fileticket=W-N6Ei848vo%3D&tabid=1146&mid=2567 We hope you find what you need, and would love to hear back from you with more details if you are successful!